IRG-2 develops new heteroanionic materials with tunable electronic, ionic, thermal, and optical properties, which are otherwise inaccessible from simpler homoanionic structures and chemistries. 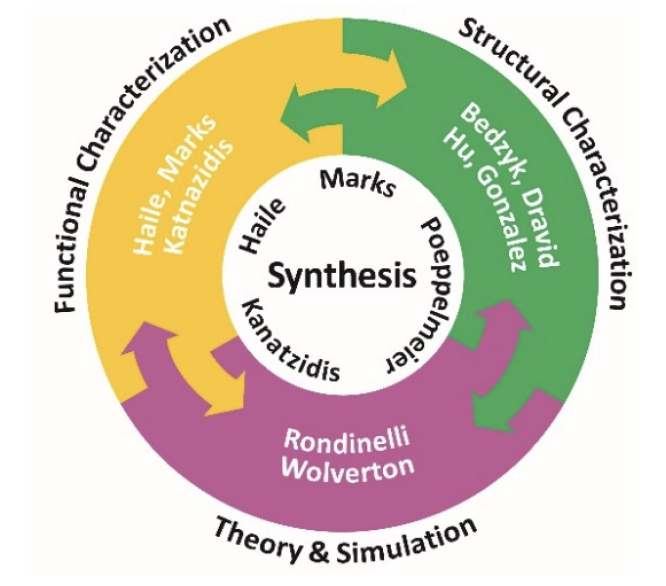 Discovery of heteroanionic materials are facilitated by synthetic and characterization methods that provide a panoramic view of crystallization and diffusion processes in which emerging phases of interest are revealed and growth mechanisms are delineated. By emphasizing synthesis as the central science, the tools, protocols, and databases formulated in IRG-2 enable synthesis-on-demand of complex materials suggested by computational discovery.